Rationale: Near-fatal asthma (NFA) has not been well studied in Saudi Arabia. We evaluated NFA risk factors in asthmatics admitted to a tertiary-care hospital and described NFA management and outcomes. Materials and Methods: This was a retrospective study of NFA patients admitted to an ICU in Riyadh (2006-2010). NFA was defined as a severe asthma attack requiring intubation. To evaluate NFA risk factors, randomly selected patients admitted to the ward for asthma exacerbation were used as controls. Collected data included demographics, information on prior asthma control and various NFA treatments and outcomes. Results: Thirty NFA cases were admitted to the ICU in the five-year period. Compared to controls (N = 120), NFA patients were younger (37.5 ± 19.9 vs. 50.3 ± 23.1 years, P = 0.004) and predominantly males (70.0% vs. 41.7%, P = 0.005) and used less inhaled steroids/long-acting ß2-agonists combination (13.6% vs. 38.7% P = 0.024. Most (73.3%) NFA cases presented in the cool months (October-March). On multivariate analysis, age (odds ratio [OR] 0.96; 95% confidence interval [CI], 0.92-0.99, P = 0.015) and the number of ED visits in the preceding year (OR, 1.25; 95% CI, 1.00-1.55) were associated with NFA. Rescue NFA management included ketamine (50%) and theophylline (19%) infusions. NFA outcomes included: neuromyopathy (23%), mechanical ventilation duration = 6.4 ± 4.7 days, tracheostomy (13%) and mortality (0%). Neuromuscular blockade duration was associated with neuromyopathy (OR, 3.16 per one day increment; 95% CI, 1.27-7.83). Conclusions: In our study, NFA risk factors were younger age and higher number of ED visits. NFA had significant morbidity. Reducing neuromuscular blockade duration during ventilator management may decrease neuromyopathy risk. Asthma is characterized by regional variation in symptom prevalence. Saudi Arabia is a unique place due to its environment, characterized by hot weather, frequent dust storms and air pollution, and culture, as people frequently burn wood soaked in fragrant oils. Asthma is estimated to affect >2 million people in the country. Several studies examined asthma in Saudi Arabia ,,, resulting in the Saudi Initiative for Asthma, which provides clinical practice guidelines for asthma management. , However, there is paucity of studies about NFA. Alzeer et al. described 54 patients with 62 severe asthma exacerbations requiring ICU admission (1996-2003) and found that only 38% were ventilated patients and all patients survived. This study explored NFA risk factors in patients admitted with NFA to a tertiary-care ICU in Saudi Arabia, described NFA management and outcomes and studied the predictors of such outcomes. This was a retrospective analysis of a cohort of patients ≥14 year old who had NFA and were admitted to the ICU of a tertiary care hospital in Riyadh between 1/1/2006 and 31/12/2010. The hospital was a 900-bed tertiary-care teaching center with an emergency department (ED) that annually treated approximately 200,000 patients. The ICU was a 21-bed medical-surgical unit with onsite board-certified intensivists on a 24-h 7-days per week basis and admitted approximately 900 patients annually. This study was approved by the hospital's Institutional Review Board. NFA has been defined as either respiratory arrest due to acute asthma or acute asthma with partial pressure of carbon dioxide (PaCO 2 ) >50 mmHg and/or altered conscious state. , Suissa defined it as hypercapnia (PaCO 2 >45 mmHg) or non-elective intubation during an asthma attack. In this study, we defined NFA as acute asthma attack associated with acute respiratory acidosis (PCO 2 >45 mmHg) and required intubation and mechanical ventilation. NFA patients were identified by reviewing the ICU database and then medical charts to confirm that they fulfilled our NFA definition. To assess NFA risk factors, 120 controls were selected using systematic sampling technique. These patients were ≥14 year-old and primarily admitted for asthma exacerbation within the same period but did not require intubation. Collected data for cases and controls included demographic characteristics, smoking history, management of asthma before admission, asthma severity and control history, exposure to allergens before presentation, clinical information on presentation, Acute Physiology and Chronic Health Evaluation (APACHE) II score,  laboratory results and chest X-ray findings. The presence of pneumonic infiltrates on the admission Chest X-rays was assessed by reviewing the official reading by a radiologist and was confirmed by a pulmonologist/intensivist. We also collected data for NFA cases on their medical management after intubation and for up to seven days. These data included the medications used for intubation, sedation, asthma control and neuromuscular blockade, level of positive end expiratory pressure (PEEP) and physiotherapy. Outcome measures evaluated included development of pneumothorax and critical-illness neuromyopathy (clinically diagnosed and documented by the treating ICU team), duration of mechanical ventilation, length of stay in the ICU and hospital, and death in the ICU or hospital. The Statistical Analysis Software (SAS, 9.2) was used for statistical analysis. Descriptive analyses were carried out by calculating the number and percent for the categorical variables and mean with standard deviation for continuous variables. Alternatively, the median with the first (Q1) and third quartiles (Q3) were reported when number of patients was less than 30. The Chi-square, Fisher's exact and Student's t tests were used to examine differences between groups as appropriate. Multivariate logistic regression analysis was performed to determine NFA risk factors. Independent variables entered in the model were clinically significant variables (age, gender, cigarette smoking, admission in cool months [October to March] vs. other months, previous intubation for asthma, previous ICU admission for asthma, number of ED visits for asthma, use of inhaled rapid-acting ß2-agonists, inhaled corticosteroid and long-acting ß2-agonists combination and oral corticosteroids at home. Multivariate logistic regression analysis was also used to evaluate neuromyopathy risk factors with the following independent variables entered in the model: Age, gender, APACHE II score, intravenous methylprednisolone dose, dose and duration of neuromuscular blockers and early (within 3 admission days) vs. late physiotherapy. Results were presented as odds ratios (ORs) with 95% confidence intervals (CIs). A P-value <0.05 was considered significant in all analyses. Thirty patients with NFA were admitted to the ICU in the five-year period and were compared to 120 patients admitted to the hospital because of asthma exacerbations (controls) in the same period. [Table 1] describes the baseline and clinical characteristics of NFA patients and controls. NFA patients were younger (37.5 ± 19.9 vs. 50.3 ± 23.1 years, P = 0.004), predominantly males (70.0% vs. 41.7%, P = 0.005) and had less prior use of inhaled corticosteroids and long-acting ß2-agonists combination (13.6% vs. 38.7% P = 0.024). Thirteen (43.3%) NFA patients and 44 (36.7%) controls used rapid-acting ß2-agonists alone (P = 0.50). Only one NFA patient was on long-acting ß2-agonists only compared with none in the control group. There were no differences in cigarette smoking history, the number of ED visits in the preceding year (3.5 ± 6.1 vs. 1.6 ± 2.0, P = 0.12), previous intubation for asthma (8.7% vs. 7.8%, P = 0.89) and use of oral corticosteroids before admission. [Figure 1] describes admission in relation to the months of the year. Most (73.3%) NFA cases presented in the cool months (October-March) compared to 57.4% for controls, P = 0.11. Figure 1: Distribution of cases and controls according to month of hospital admission. Both near-fatal asthma and asthma exacerbation were more commonly admitted in the cooler months of the year. On workup, NFA patients had lower admission pH (7.06 ± 0.13 vs. 7.36 ± 0.08, P < 0.0001), higher PCO 2 and white blood cell count, but no difference in eosinophilia, creatinine and presence of pneumonic lung infiltrates on chest radiographs [Table 1]. On multivariate analysis, age (OR, 0.96; 95% CI, 0.92-0.99) the number of ED visits in the preceding year (OR, 1.25; 95% CI, 1.00-1.55) and the use of inhaled steroids/long-acting ß2-agonists combination (OR, 0.27; 95% CI, 0.04-1.58) were associated with NFA. For intubation, fentanyl (92.1%) and midazolam (82.8%) were the most commonly used medications. Propofol (41.4%) and ketamine (27.6%) were less commonly used for induction of patients. Neuromuscular blockade was employed in 31% of patients. [Table 2] describes the medical management of NFA after intubation. It included frequent bronchodilation using the combination of salbutamol and ipratropium and intravenous corticosteroids in all patients. Intravenous magnesium sulphate was used on the first day in 50% of patients. Therapies for refractory bronchospasm included ketamine infusion (50%) and theophylline infusion (19.2%). Ketamine infusion was started on the first day in 13 patients, and in one patient on each of the fourth and seventh days and was continued for a median of 2 days (Q1-Q3, 1-4 days). Theophylline infusion was used on the first day for 5 patients and on the fifth day for one patient, for a median of 2 days (Q1-Q3, 1-3 days). Theophylline level was measured at least once in three of these patients. The level was therapeutic (median level 63 μmol/L; therapeutic range, 44-111 μmol/L) in two patients and sub-therapeutic (17 μmol/L) in one patient who received theophylline infusion for less than 24 hours. Most (93.1%) patients were additionally treated with antimicrobial agents. Mechanical ventilation management included the use of zero extrinsic PEEP in 51.7% of patients on the first day, 44.4% on the second day and 40% on the third day. Neuromuscular blockade as cisatracurium infusion was given to facilitate management of mechanical ventilation in 75.9% of patients. It was started on the first day in 64.3% of patients. The median daily dose was 127 mg (Q1-Q3, 50-179 mg) for a median of 2 days (Q1-Q3, 2-3.5 days). Physiotherapy was routinely provided for 73.1% of patients, but in only 21.1% physiotherapy was started early in the first three days of hospitalization. [Table 3] describes the outcomes of NFA patients. None of the NFA patients had pneumothorax. Tracheostomy was performed in 15.4%. The duration of mechanical ventilation was 6.4 ± 4.7 days (median = 5.5, Q1-Q3, 2.8-9.2 days). The length of stay in the ICU was 8.2 ± 5.7 days (median = 7.5, Q1-Q3, 4.0-11.0 days). None of the NFA patients died. Neuromyopathy was clinically diagnosed in 23.1% of patients. The baseline characteristics of these patients (age, APACHE II score, arterial ph and PCO 2 ) were not different compared to those who did not develop neuromyopathy. All of them received continuous infusion of neuromuscular blockers for ventilator management. Compared to other NFA patients, they were on similar doses of methylprednisolone (325 ± 97 vs. 254 ± 115 mg per day, P = 0.18) and of cisatracurium (177 ± 87 vs. 172 ± 283 mg per day, P = 0.96). Moreover, neuromuscular blockade was continued for longer period in them (4.8 ± 2.2 vs. 1.5 ± 1.1 days, P = 0.01). Additionally, none of them received early physiotherapy compared to 20.0% of patients without neuromyopathy, P = 0.32. On multivariate analysis, neuromuscular blockade duration (OR, 3.16 per one day increment; 95% CI, 1.27-7.83) and APACHE II score (OR, 1.07; 95% CI, 0.89-1.29) were associated with development of neuromyopathy. Of the four patients who required tracheostomy, only one patient had neuromyopathy. The main findings of this study were the following: NFA was uncommon with only 30 cases admitted in five-year period; younger age and higher number of asthma-related ED visits were significant risk factors for NFA; NFA management included many rescue interventions reflecting the severity of the disease and neuromyopathy was a frequent outcome of NFA with neuromuscular blockade duration being a significant risk factor. Severe asthma attacks frequently require hospitalization with 10% of admissions ending up in the ICU. Intubation and mechanical ventilation are required in up to one-third of these ICU admissions. In this study, NFA was uncommon as only 30 cases were admitted to our ICU, which annually admitted approximately 900 patients. In our study, most of these cases occurred during the cooler months in Riyadh and probably coincided with the season of respiratory tract infections and sand storms. Younger age and higher ED visits in preceding year were significant risk factors. Identifying NFA risk factors helps targeting high-risk patients with close monitoring and management optimization, which may prevent life-threatening asthma attacks. Clinical practice guidelines provide clear recommendations for managing asthma exacerbations in the acute care setting, , but do not specifically address NFA management. This may lead to significant management variability, which was observed in our study. The standard therapies of acute asthma exacerbations, such as rapid-acting inhaled ß2-agonists (Evidence A) and systemic corticosteroids (Evidence A), ,, were used for NFA management in our study. Intravenous magnesium sulphate, recommended for patients with severe bronchospasm who fail to improve promptly to bronchodilators (Evidence B),  was provided for 50% of patients. When faced with refractory bronchospasm, other therapies based on lower level of evidence are frequently used by intensivists. These therapies include intravenous infusions of ketamine, theophylline and neuromuscular blockers. 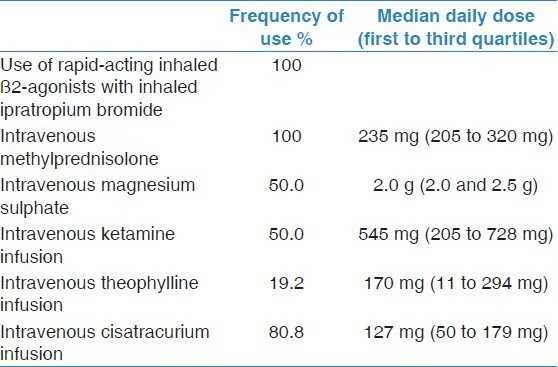 Because of its bronchodilator effect, mediated by ß2-agonist stimulation,  ketamine can be used to facilitate intubation. Ketamine infusion was used in 50% of our NFA patients, however, the evidence for this use is lacking especially in adults. Another medication that is considered in management of refractory asthma is intravenous theophylline, used in 19.2% of our NFA patients. Intravenous theophylline is not recommended for routine management of severe asthma  as the clinical benefits of intravenous theophylline in intubated patients are unknown. A review of fifteen trials of moderate quality found that adding intravenous theophylline to inhaled ß2-agonists in adult patients with asthma attacks treated in the emergency setting failed to show any evidence of benefit and was associated with a higher incidence of adverse effects compared with standard care. For intubated patients with refractory asthma, intravenous theophylline can be used but with extreme caution especially in patients with significant comorbidities. The use of continuous neuromuscular blockade while mechanically ventilating asthmatic patients may have beneficial effects such as reducing the risks of barotrauma and dyssynchronous breathing. Cisatracurium is considered a good choice because of its side effect profile and route of metabolism. However, neuromuscular blockade after intubation is recommended only for patients who fail to have adequate relaxation with deep sedation alone , because of increased morbidity as will be discussed next. The study should be interpreted taking into considerations its limitations. The sample size is small and the study was performed in one center. This is because we studied very severe asthma cases. Additionally, we did not have data on pulmonary function tests and did not collect data on all asthma management interventions. Moreover, neuromyopathy was based on clinical diagnosis as documented by physicians and not on nerve conduction or electro-myographic studies. In conclusion, NFA was uncommon and associated with younger age and higher number of asthma-related ED visits. Limiting the use of neuromuscular blockade, early corticosteroid weaning and early physiotherapy may be reasonable approaches to reduce NFA-associated morbidity. None of the NFA patients died, likely as a result of the general improved management of these patients. 1. Ruffin RE, Latimer KM, Schembri DA. Longitudinal study of near fatal asthma. Chest 1991;99:77-83. 2. Sears MR, Rea HH, Beaglehole R, Gillies AJ, Holst PE, O′Donnell TV, et al. Asthma mortality in New Zealand: A two year national study. N Z Med J 1985;98:271-5. 3. Suissa S, Blais L, Ernst P. Patterns of increasing beta-agonist use and the risk of fatal or near-fatal asthma. Eur Respir J 1994;7:1602-9. 4. Alvarez GG, Schulzer M, Jung D, Fitzgerald JM. A systematic review of risk factors associated with near-fatal and fatal asthma. Can Respir J 2005;12:265-70. 5. Behbehani NA, Al-Mane F, D′Yachkova Y, Paré P, FitzGerald JM. Myopathy following mechanical ventilation for acute severe asthma: The role of muscle relaxants and corticosteroids. Chest 1999;115:1627-31. 6. Marquette CH, Saulnier F, Leroy O, Wallaert B, Chopin C, Demarcq JM, et al. Long-term prognosis of near-fatal asthma. A 6-year follow-up study of 145 asthmatic patients who underwent mechanical ventilation for a near-fatal attack of asthma. Am Rev Respir Dis 1992;146:76-81. 7. Kao CC, Jain S, Guntupalli KK, Bandi V. Mechanical ventilation for asthma: A 10-year experience. J Asthma 2008;45:552-6. 8. Pearce N, Ait-Khaled N, Beasley R, Mallol J, Keil U, Mitchell E, et al. Worldwide trends in the prevalence of asthma symptoms: Phase III of the International Study of Asthma and Allergies in Childhood (ISAAC). Thorax 2007;62:758-66. 9. Al Frayh AR, Shakoor Z, Gad El Rab MO, Hasnain SM. Increased prevalence of asthma in Saudi Arabia. Ann Allergy Asthma Immunol 2001;86:292-6. 10. Al-Jahdali HH, Al-Hajjaj MS, Alanezi MO, Zeitoni MO, Al-Tasan TH. 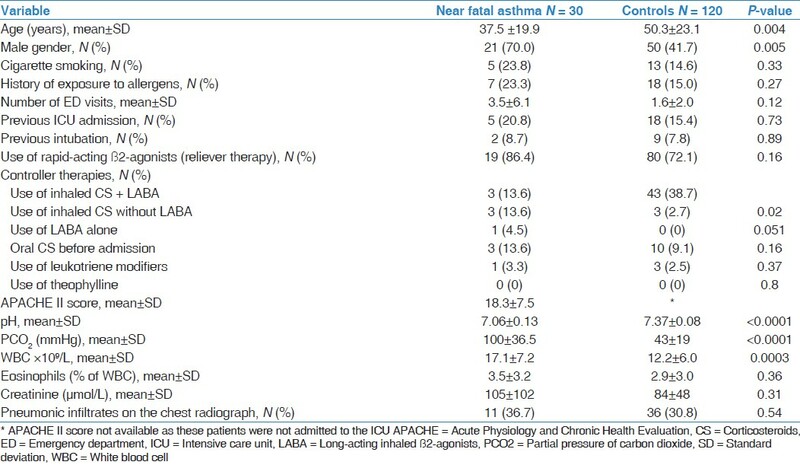 Asthma control assessment using asthma control test among patients attending 5 tertiary care hospitals in Saudi Arabia. Saudi Med J 2008;29:714-7. 11. Abudahish A, Bella H. Primary care physicians perceptions and practices on asthma care in Aseer region, Saudi Arabia. Saudi Med J 2006;27:333-7. 12. Al Moamary MS. Unconventional therapy use among asthma patients in a tertiary care center in Riyadh, Saudi Arabia. Ann Thorac Med 2008;3:48-51. 13. Al Moamary MS, Al-Kordi AG, Al Ghobain MO, Tamim HM. Utilization and responsiveness of the asthma control test (ACT) at the initiation of therapy for patients with asthma: A randomized controlled trial. BMC Pulm Med 2012;12:14. 14. Al-Moamary MS, Al-Hajjaj MS, Idrees MM, Zeitouni MO, Alanezi MO, Al-Jahdali HH, et al. The Saudi Initiative for asthma. Ann Thorac Med 2009;4:216-33. 15. Al-Moamary MS, Alhaider SA, Al-Hajjaj MS, Al-Ghobain MO, Idrees MM, Zeitouni MO, et al. The Saudi initiative for asthma - 2012 update: Guidelines for the diagnosis and management of asthma in adults and children. Ann Thorac Med 2012;7:175-204. 16. Alzeer A, BaHammam A, Masood M, Basha SJ, Alhamad E, Sohail S. Outcome of patients with severe asthma in the intensive care unit. Ann Saudi Med 2006;26:461-5. 17. Arabi Y, Alshimemeri A, Taher S. Weekend and weeknight admissions have the same outcome of weekday admissions to an intensive care unit with onsite intensivist coverage. Crit Care Med 2006;34:605-11. 18. Knaus WA, Draper EA, Wagner DP, Zimmerman JE. APACHE II: A severity of disease classification system. Crit Care Med 1985;13:818-29. 19. Pendergraft TB, Stanford RH, Beasley R, Stempel DA, Roberts C, McLaughlin T. Rates and characteristics of intensive care unit admissions and intubations among asthma-related hospitalizations. Ann Allergy Asthma Immunol 2004;93:29-35. 20. McFadden ER Jr. Acute severe asthma. Am J Respir Crit Care Med 2003;168:740-59. 21. Bateman ED, Hurd SS, Barnes PJ, Bousquet J, Drazen JM, FitzGerald M, et al. Global strategy for asthma management and prevention: GINA executive summary. Eur Respir J 2008;31:143-78. 22. Restrepo RD, Peters J. Near-fatal asthma: Recognition and management. Curr Opin Pulm Med 2008;14:13-23. 23. Brown RH, Wagner EM. Mechanisms of bronchoprotection by anesthetic induction agents: Propofol versus ketamine. Anesthesiology 1999;90:822-8. 24. Brenner B, Corbridge T, Kazzi A. Intubation and mechanical ventilation of the asthmatic patient in respiratory failure. Proc Am Thorac Soc 2009;6:371-9. 25. Aroni F, Iacovidou N, Dontas I, Pourzitaki C, Xanthos T. Pharmacological aspects and potential new clinical applications of ketamine: Reevaluation of an old drug. J Clin Pharmacol 2009;49:957-64. 26. Parameswaran K, Belda J, Rowe BH. Addition of intravenous aminophylline to beta2-agonists in adults with acute asthma. Cochrane Database Syst Rev 2000;4:CD002742. 27. Holley AD, Boots RJ. Review article: Management of acute severe and near-fatal asthma. Emerg Med Australas 2009;21:259-68. 28. Papiris S, Kotanidou A, Malagari K, Roussos C. Clinical review: Severe asthma. Crit Care 2002;6:30-44. 29. Nee PA, Benger J, Walls RM. Airway management. Emerg Med J 2008;25:98-102. 30. McFadden ER Jr, Ingram RH Jr, Haynes RL, Wellman JJ. Predominant site of flow limitation and mechanisms of postexertional asthma. J Appl Physiol 1977;42:746-52. 31. Tuxen DV. Detrimental effects of positive end-expiratory pressure during controlled mechanical ventilation of patients with severe airflow obstruction. Am Rev Respir Dis 1989;140:5-9. 32. Tobin MJ. Advances in mechanical ventilation. N Engl J Med 2001;344:1986-96. 33. Afessa B, Morales I, Cury JD. Clinical course and outcome of patients admitted to an ICU for status asthmaticus. Chest 2001;120:1616-21. 34. de Jonghe B, Lacherade JC, Sharshar T, Outin H. Intensive care unit-acquired weakness: Risk factors and prevention. Crit Care Med 2009;37:S309-15. 35. Leatherman JW, Fluegel WL, David WS, Davies SF, Iber C. Muscle weakness in mechanically ventilated patients with severe asthma. Am J Respir Crit Care Med 1996;153:1686-90. 36. Morris PE, Goad A, Thompson C, Taylor K, Harry B, Passmore L, et al. Early intensive care unit mobility therapy in the treatment of acute respiratory failure. Crit Care Med 2008;36:2238-43. 37. Shapiro JM. Intensive care management of status asthmaticus. Chest 2001;120:1439-41.